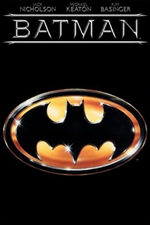 I was nine years old when Tim Burton rebooted the beloved Batman franchise, replacing the aging Adam West with a much younger (and, for many fans, much more controversial) Michael Keaton and giving audiences their first look at a Gotham City that was dripping with darkness. Far from the bright palettes and cartoony enemies of the 1960’s TV show, this new Batman was grim, unflinching, and strikingly violent. It also ushered in a new era for comic book movies and summer blockbusters, and reaping a pile of cash for Warner Brothers that continues to grow to this day. But was the movie any good, or was it all spectacle and marketing? The answer is a little of both. There are few effects-heavy movies that stand the test of time; aside from the original Star Wars trilogy, Kubrik’s masterful 2001: A Space Odyssey, and classics like Jason and Argonauts, modern audiences have little patience for obvious blue-screen chroma key and once high tech effects like stop motion. Unfortunately, Batman does not hold up quite so well, but this wouldn’t be a problem if the plot and acting were any good. As it stands, Batman can be seen today as an average comic book film or a sub-par comic book film, but either way it’s not much use outside of a footnote in the annals of summer blockbuster history books. I grew up on the cheesy but lovable Batman after-school reruns where Batman and Robin battled an endless array of implausible foes while spouting dialog so terrible it made George Lucas look like Shakespeare. It was campy and fun, and you have to respect a guy like Adam West who acts so badly with such utter conviction. Burton eschews much of this campiness, but his version of Batman is trapped in movie limbo: despite the dark and serious tone of the film, we are nonetheless asked to accept wild and outlandish premises that only work when planted firmly in the roots of 1960’s cheese. Street thugs, crime bosses, and city officials are depicted as two-dimensional caricatures, barking out lines of such obvious exposition that it’s like watching an eighth-grade school project. Jack Napier, one of the higher-ups in the Gotham crime syndicate, falls into a giant vat of green toxic waste which transforms him into the venerable Joker. And his plot to take down the city (because what else would a criminal mastermind do) involves contaminating all the city’s cosmetic products with poison that causes victims to die of laughter (no I am not making this up). Kind of makes the idea of exploding sharks seem almost normal. 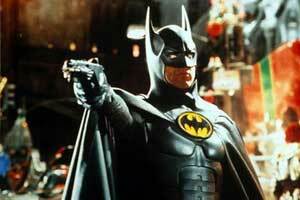 Michael Keaton is Batman...striking bewilderment into the hearts of Gotham City criminals. As if to countermand the potential silliness of some of these plot devices, this Batman is surprisingly violent. Almost too much for a PG-13 rating, and certainly more than what most parents would be comfortable having their kids watching. Watching the Joker dance around the room as he gleefully pumps his victim full of lead is a far cry from the classic Wham-Bam-Pow fight scenes of yore. It serves the character, one might argue, but to me it reeks of overcompensation. But throughout the film Jack Nicholson’s turn as the Joker is extremely well acted and the character more or less holds his own when pitted against Heath Ledger’s masterful portrayal of the same character in 2008’s The Dark Knight. Unfortunately the same cannot be said for the bland, charisma-draining performance of Michael Keaton. Woefully miscast as Bruce Wayne and his crimefighting alter ego, Keaton somehow manages to pump out lines like “I am Batman” with a straight face, though probably because he does it while wearing a mask. The romance between him and Vicky Vale (Kim Bassinger, trying her best to fend off her 40’s) is as shallow and unbelievable as we might expect from a 1989 comic book movie, and only serves to give Batman a reason to go after the Joker in the end. After all, what better motivation could a superhero have for fighting the bad guy than to get back his kidnapped girlfriend? I have a feeling that if Tim Burton were to be able to re-make his original film today it would be more in line with Christopher Nolan’s mature, dark, and introspective Batman Returns and The Dark Knight. But back in 1989 audiences were hardly accustomed to plausible superheroes with innter turmoil and realistic villains, and in that sense I can kind of understand the motivation for straddling the line between comic book absurdity and dark reflections of reality. But ultimately Batman is a lot of spectacle without much substance to back it up. I’m glad I’m not the only one who thinks B. Begins and Dark Knight were better than this one. I was actually eager to rent it again after seeing Begins, and was genuinely disapointed. I think the achievements of the new movies have a lot to do with something that happened in the mid ’90s: Batman the Animated Series. This was certainly one of the best, if not THE best show ever to hit television, and it showed what a great story Batman really is, and how great a retelling can be. Burton had no idea of the potential of his francise. He could have made a film for the history books, but he chose to take the easy road and just make the latest summer blockbuster. Agreed–Batman Begins was the first cartoon I can remember seeing that dared to go to places that were taboo for the medium. It was dark, philosophical, and dealt with deep moral questions. It did not pander to its audience and instead proved that children can handle character dramas instead of wacky explosions. The series no doubt influenced the Christopher Nolan productions, and basically every comic book movie to come out since the late 1990’s. I’m surprised by all the hating on Burton’s Batman films. Comparing these to Christopher Nolan’s films of course makes both the ’89 Batman and Batman Returns obsolete in many ways. But Burton’s films are just and dark and grim and his world exists in a fictional one providing that mystical element that works much better as a ‘comic book’ film. Nolan’s films and his characters are confined by a ‘real-world’ landscape. Now I will say ‘Batman Forever’ and ‘Batman & Robin’ are pretty bad to terrible, but Burton’s two entries have that mythic pop that I think this generation’s Batman misses out on. Also take into account that the world hadn’t seen a ‘serious’ Batman take until Burton came along. I don’t think Nolan’s films would exist without the successful steps of Burton in 1989 and 1992. Now all this to say, yes, Nolan’s films are in another league—but Burton’s two films are arguably just as notable for their time, specifically as a different style of movie. Man has not always been at the top of the food chain. Only in the last two centuries did our ingenuity give us the tools to overcome the world’s top predators. Before that, humans huddled around campfires for eons. However, there are many instances where a human settlement became little more than a buffet to a lion, a pack of wolves, or the Beast of Gevaudan. The most frightening thing about the Beast? Nobody knew what it was.